Sunny to partly cloudy. High 84F. Winds SW at 5 to 10 mph..
Generally clear skies. Low 59F. Winds light and variable. SILVER LAKE – Two outdoor staircase murals off of Sunset Boulevard have been brightening the neighborhood for nearly four years now. But the artists never received city permission to paint them on public property. Last week, however, the city’s Cultural Affairs Commission approved the murals as public art – retroactively. 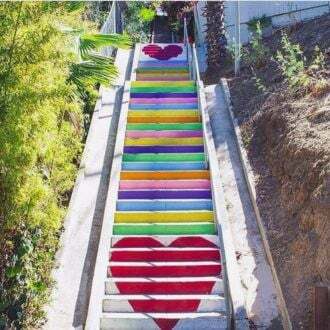 “Stair Candy,” a multi-colored rise of hearts and pastels on the Micheltorena Staircase between Micheltorena Street and Sunset Boulevard. was painted in April 2015 by artists Corinne Carrey, Carla Obrien, and Mandon Bossi. The colorful stairway has proven a popular spot for Instagram portraits. 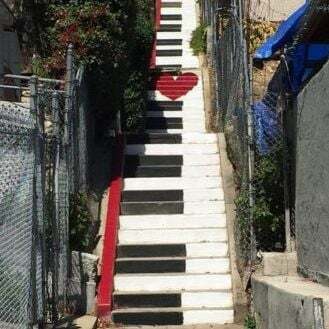 The following month, Carrey made another mural, “Stair Tempo,” patterned on piano keys, on the Hamilton Staircase between Sunset Boulevard and Hamilton Way. The proposal before the commission noted that the murals were created in response to neglect in the area, and a need for beautification.